When you’re launching a business, the first thing you need are leads. Before you even begin an email marketing campaign, you need to know who to contact. You can either begin sending out your top sales performers to prospect on their own, or you can purchase a B2B data list. But whether this is a good idea for your business depends a lot on your organization and its infrastructure. A B2B data list gives an organization the foundation that it needs to begin building up their leads. Even a moderate quality data list gives a sales team something to start with. From there, they can contact these leads and begin scoring them. Some companies maintain very high quality lists that are both up-to-date and detailed… but businesses will end up paying for the quality of that list. B2B data lists can be automatically imported into many customer relationship management suites or sales prospecting suites, and from there sales professionals can begin to immediately build up relationships and work towards sales. Many of these data lists have enough information to filter out the leads that are most likely to be helpful, ranging from industry to company size. B2B data lists do have some disadvantages, which primarily relate to the source of the data. Purchasing a B2B data list can result in large volumes of unusable data, if the list doesn’t cater to an organization’s industry or has not been updated in some time. Frequently a list may not have usable data at all, making it meaningless in terms of B2B sales; this is frequently found in outdated email lists, which are comprised mostly of inactive accounts. Unlike an actual prospecting platform, a B2B data list doesn’t help with scoring leads or generating useful leads. Instead, it just gives the sales professionals a contact list that they can work from. This list may also be filled with leads who aren’t interested in being contacted. It is possible to potentially buy a list with someone who has placed themselves on a “no contact” registry. From there, it’s actually possible to end up being fined for using a B2B data list, if the contacts on the list weren’t appropriately vetted. Ultimately, B2B data list is most useful when it is accessed through the use of a prospecting platform or tool. A prospecting platform contains living data that is updated and accurate, rather than a B2B data list that can quickly become outdated. Prospecting platforms will help with not only generating leads but also in scoring them and building relationships with them. Lead generation is hard. 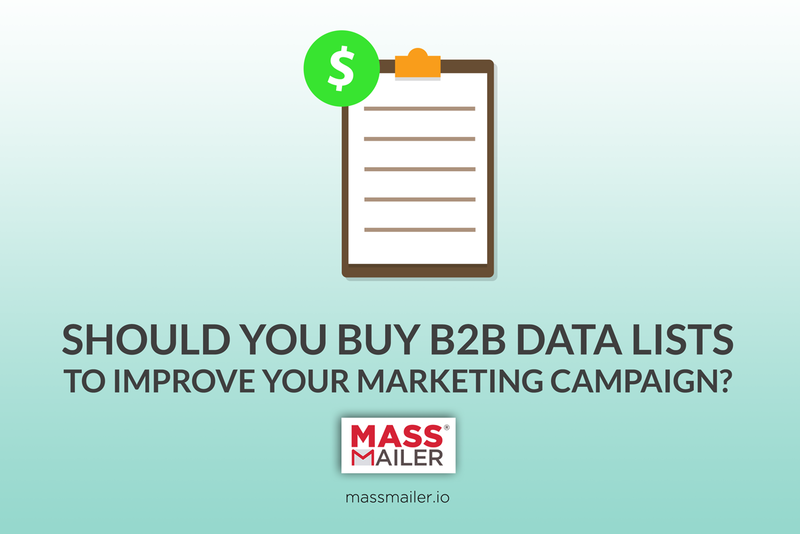 For some businesses, buying B2B data lists can help give the kickstart a business needs. But for others, B2B data lists will be largely useless; no amount of sales training or sales advice can make a useless list effective. Investing in sales prospecting from the beginning will give valuable, well-scored leads who are far more likely to commit. Mass Mailer Prospector is an all-in-one B2B prospecting platform that makes it easy to find and score prospective leads throughout any industry. Sign up for Mass Mailer Prospector today to get a free trial.